Munich is one of Europe´s most enchanting cities. Exploring its narrow cobbled streets or wide sunlight boulevards with views of the Bavarian Alps is a delight. Each autumn, millions of revellers from around the world join locals in their legendary Octoberfest, one of the world's biggest festivals. Munich is one of Europe´s most enchanting cities. Exploring its narrow cobbled streets or wide sunlight boulevards with views of the Bavarian Alps is a delight. Each autumn, millions of revellers from around the world join locals in their legendary Octoberfest, one of the world’s biggest festivals. Yet many visitors also know that Munich has a past so dark that it cast a looming shadow over the twentieth century: this was the city which played a unique role in the ascent of Nazism, the Third Reich and Adolf Hitler. It was in Munich that Hitler first entered the murky world of beer Keller politics after the First World War. It was here that he established the fanatical base of his NSDAP party so that the city was, in his words, ‘the capital of the movement’. This illustrative new book explains how Munich and its surrounds became inextricably linked with the rise and fall of Nazism. 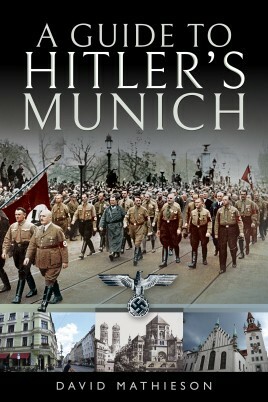 It provides the modern reader with a detailed guide to what happened where in the city, why those events were important in the unfolding history of the Third Reich – and why they remain a timely warning today. Dr David Mathieson is a writer based in Germany. David is a qualified solicitor and has a PhD in contemporary history. He was a Special Adviser to the former British foreign minister, the late Robin Cook. A specialist on the Spanish Civil War, he is the founder of Spanish Sites, an educational project to promote an understanding of the Spanish civil war. He is the author of Frontline Madrid, and Radical London in the 1950s.